A particularly happy combination of flavours, this spicy, delicately sweet dish is delicious piled on a heap of fluffy rice. To prepare rice for 4, Japanese-style, thoroughly rinse 300g shortgrain rice, cover with water in the proportion of 5 parts rice to 6 parts water, and soak for 30 minutes. Then bring rapidly to the boil, put on the lid, turn down the heat and boil for 5 minutes until the water is absorbed. Reduce the heat to the minimum and leave undisturbed and tightly lidded for 15 minutes. Leave to rest for 10 minutes before serving. Peel equally spaced, full-length strips of skin from top to bottom of the aubergines, creating a striped effect. Cut into 1cm-thick rounds and drop into cold water (a Japanese technique to soften the flavour). Peel the prawns, leaving the tails in place, and nick out the dark vein that runs down the back. Toss the prawns with the soy sauce and half the ginger. Set aside to marinate. When you are ready to begin cooking, drain the aubergines and pat them dry. Heat the oil in a wok or frying pan over a moderately high heat. Toss in the remaining ginger and let it fry for a few seconds. Add the aubergine rounds and stir-fry over a moderate heat for 5 minutes. Mix all the sauce ingredients together and add them to the pan. Stir-fry until the aubergine is soft and the sauce reduced to a delicate veil - around 5 or 6 minutes. Lay the prawns on top, lid loosely and wait until they turn opaque - this should take a couple of minutes, no more. 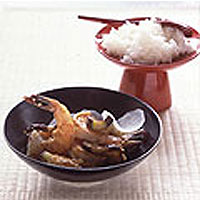 Sprinkle with sesame seeds and serve spooned over white rice, perhaps with spring onions and white radish on the side.